Lofty: Your local award winning radio station! We’ve been a bit quiet here lately (although still active on Facebook, and VERY active in the background … more news coming soon) … but Lofty is proud to announce that we have won our first award! 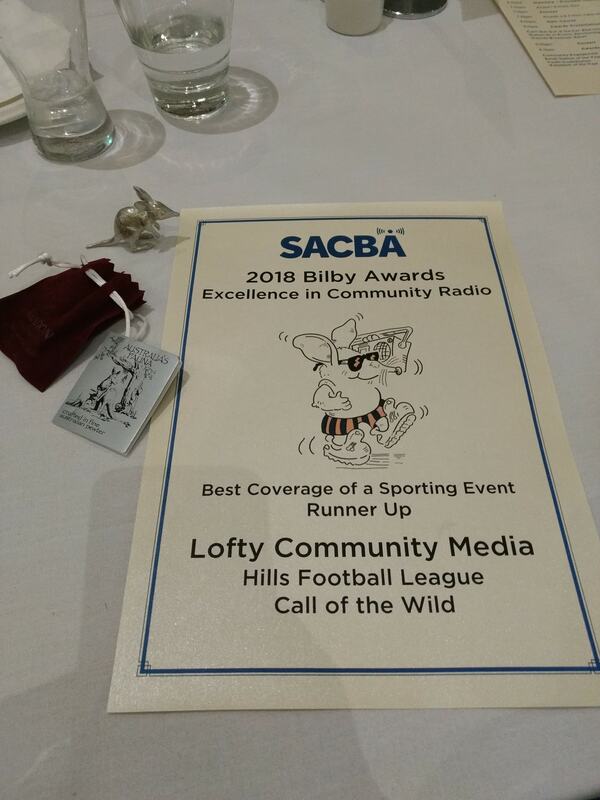 Lofty’s coverage of the 2018 HFL Season has taken out the runner-up prize for Best Coverage of a Sporting Event at the 2018 SACBA Bilby Awards. SACBA is the peak body for community broadcasting in South Australia, with over 30 community broadcasters across the state and along the border with Victoria and NSW in its cohort. Being recognised as a leader in community media within such a short time is truly humbling. Of couse, we couldn’t have done this without a winning team: Jeff Pistola, Ben Goldfinch, Robert Shearwood, Tony Sander and Matt Adam. To find out how Lofty impressed SACBA, check out hillsfooty.com – the official HFL Media site, built and maintained by Lofty. Special thanks to the Hills Football League for giving Lofty the opportunity to assist with getting HFL matches to the masses. With a bit of luck, you may just hear the HFL on FM in 2019. Watch this space.